New for February 2016! Our friends over at Keysight have sent us an ANOTHER helpful video (including downloadable tools and templates) about amplifiers. This time Matt is talking about classes A, AB, and B. The curves of a transistor are shown in the following two figures. First is a field effect transistor. Here the current source is voltage controlled, which means that there is virtually no current on the input (gate) terminal. In the case of a bipolar device (such as an HBT) the device acts like a current controlled current source. The bias point, also known as the quiescent point "Q" is a function of the voltage (or current) on the input terminal, and the voltage on the output terminal. We've shown the bias points for class A, AB, B on the IV curve for comparison. Class A small signal operation is linear. Bias point is at halfway between saturated current and pinch-off. When you hear he words "gain block" or "linear amplifier", think Class A. The output signal uses 100% of the input signal waveform. In class B the transistor conducts only in one half cycle of the signal. 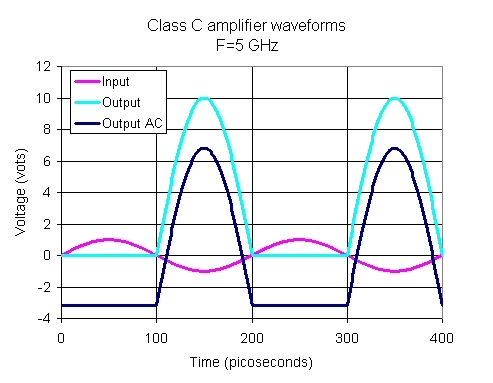 Thus for no excitation by an input signal, the DC power consumed in Class B is ideally zero for a FET-based amplifier, and very low for a bipolar amplifier. Theoretical maximum efficiency for Class B is 78.5 %. A "complimentary amplifier", or push-pull amplifier uses opposite polarity (PNP and NPN) transistors that operate class B yet still provide the full waveform. There is distortion in that the transistors each have threshold voltages to overcome, which can be reduced by bias circuit on the input. Here the devices is biased somewhere between linear (Class A) and Class B, perhaps at 25% of the maximum current IMAX. This is by far the most popular bias point for a power amplifier, offering a good compromise between gain, power and efficiency. Quite often the gain of a solid state device is reduced the closer you are to a zero-current bias point. This is similar to Class B but a tuned circuit brings only the intended frequency out of the device. Class E amplifiers use LC tank circuits, like class C amplifiers, but in a class E amplifier, the active device becomes a switch. Want to learn more about class E power amplifiers? Watch this video from Keysight. It will take less than 15 minutes of your time, AND it links to sample files you can download. Class D and F are also onsidered "switching amplifiers". We'll save that discussion for another day, when someone wants to help us out!